Gilmore v. Gonzales :: Want to Fly? Papers, Please. Want to Fly? Papers, Please. On July 4, 2002, John Gilmore went to Oakland International Airport. He had a ticket in his own name with Southwest Airlines to Baltimore-Washington International Airport. The purpose of his trip was to petition the government for redress of grievances – specifically, the requirement for airline travelers to provide identification. John politely refused to show his ID and was not allowed to fly. 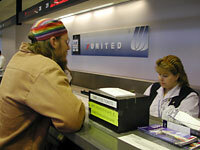 John then went to San Francisco International Airport and attempted to fly to Washington, DC on United Airlines. There he was informed that if he was not willing to show ID he could fly, but only if he submitted to a far more intrusive search than what every passenger goes through at the security checkpoint. He politely declined the search and again was not allowed to fly. Showing ID. Intensive searches. What's going on here? Sorry, Sir... that law's a secret. That's what John Gilmore wanted to know. At San Francisco's airport, just like the rest of the country's airports, there was a sign that began "A Notice From the Federal Aviation Administration" and includes the sentence "passengers must present identification upon initial check-in. John worked his way up the bureaucratic chain and was eventually told by United Airlines that there were security directives that mandated the showing of ID, but that he couldn't see them. These secret directives, issued by the Transportation Security Administration, are revised as often as weekly, and are transmitted orally rather than in writing. To make things even more confusing, these orally transmitted secret rules change depending on the airport. John Gilmore left the airport and has not attempted to fly in the United States since that day. He did, however file a lawsuit, and it's now up to the Supreme Court to get to the bottom of this. Since John filed his suit, the public has found out several things. First, the 9th Circuit has seen the Secret Law on ID at airports and, according to them, one can either choose to show ID or 'volunteer' for additional screening. Many people have since chosen 'secondary screening' at airports around the country and successfully flown without showing their papers, most famously a member of the Department of Homeland Security's Privacy Advisory Committee. Others have tried to do the same and have been denied the right to fly. Signs at airport across the country continue to state that ID is required in order to fly, and TSA's website makes the same misleading claim. A member of the flying public can never be sure as to which policy will be enforced: the law as stated by the 9th Circuit or the law as it (apparently falsely) reads on airport signs and government websites. Until Americans have the ability to know the contents of the laws being applied to them, our Republic is in danger.